Sunset, down Catherines pass, up sw facing, Wolverine to Patsy Marley out Grizzly gulch. Wind affected, except for the most sheltered areas lower in elevation. Overcast skies, mild temperatures, winds from the west and south gusting into the 30mph. Zero. Pole probing and observations indicated a variety. Satstrugi, wind crusts of varying thickness over a variety of old snow. Some surface recrystalized remains, some has been blown into crusts, some is under the crusts. Bottom layering is aspect dependent. Concerns would be of lingering isolated instabilities within the old snow. Scattered new drifts overlying recrystalized would be a new isolated concern. Some of those would be hard slabs, not very thick, where discovered. New snow avalanche potential on slick crusts dependent on bonding, old with new. 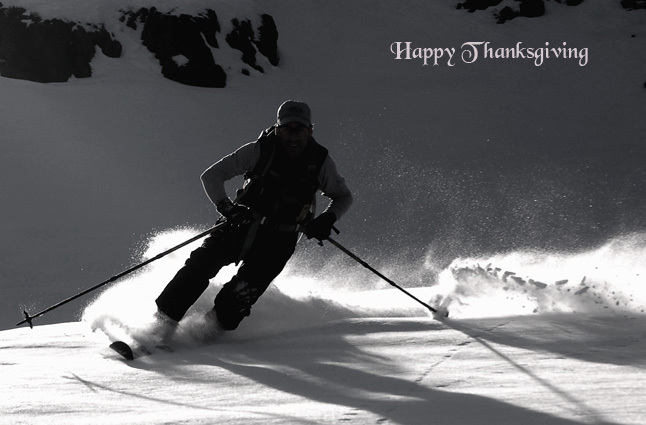 Since it was Thanksgiving, I went to ski on Gobblers Knob, a somewhat annual event. Followed the Bowman trail to the base of Yellow Jacket, where I changed my mind, thinking of dropping into Alexander Basin. Thrashing through the shrubbery, eventually breaking into the open, followed the ridge to nowhere to the top. In the process I broke a ski pole and lost my sunglasses. A retreat was required. Skiing down was actually quite good. 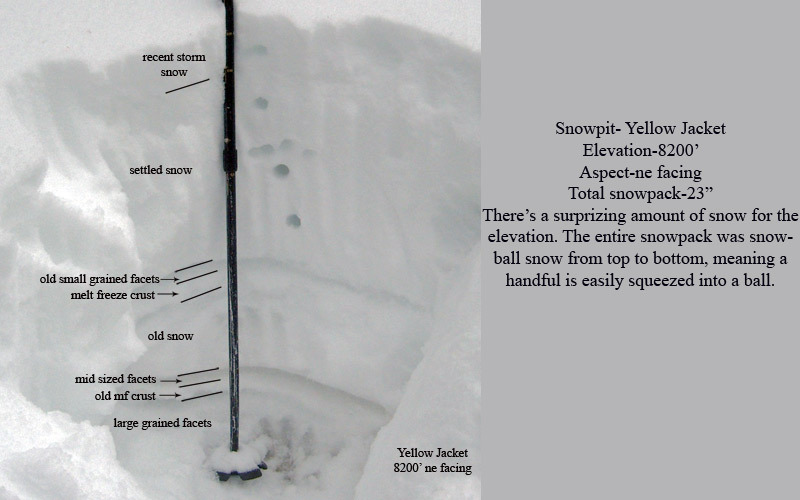 While foot penetration is near the ground, the dense snow provides good support on skis. The damp snow is somewhat loose grained having undergone a couple of periods where it's faceting, then warming to damp snow. A period of cold temperatures would promote recrytalization, causing a poor bond with any significant amount of new snow and resulting in easily sluffing of the surface layering, without new snow.